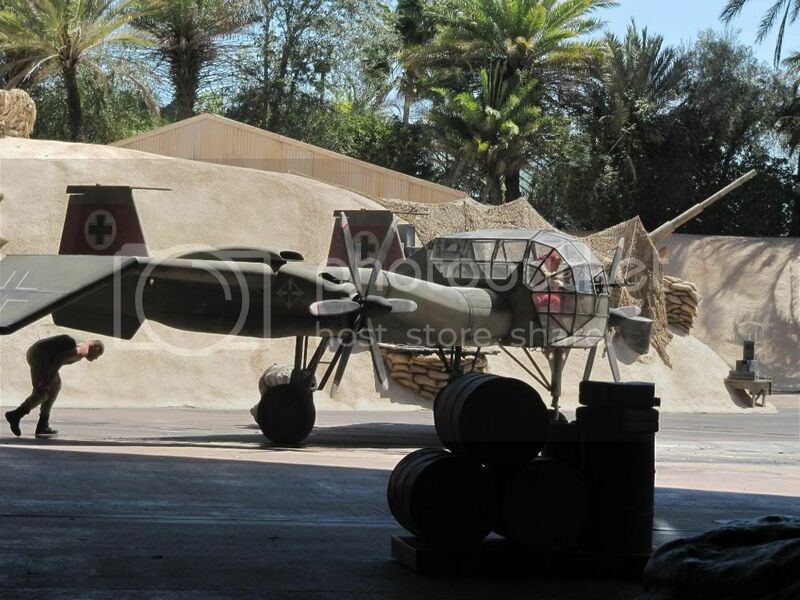 Indiana Jones fans will be familiar with this scene but can you identify the aircraft? What's the German word for dragonfly? I am proberly wrong it's a jet power wing. 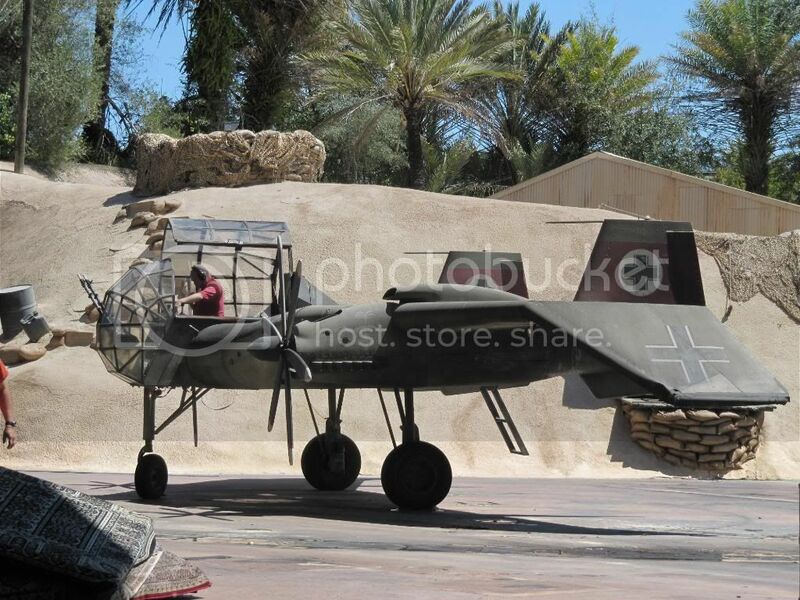 After a bit of educational searching my conclusion is that it isn't (a plane at all, that is). 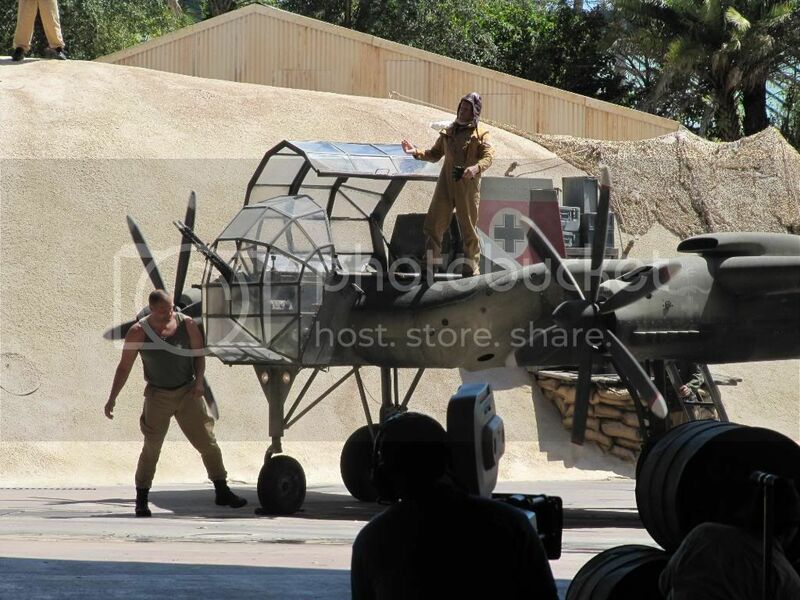 The (much larger) one used in the film was also a prop, rather than a plane, I believe, and this scaled down version is a piece of total fiction for the stunt spectacular based on the film isn't it? 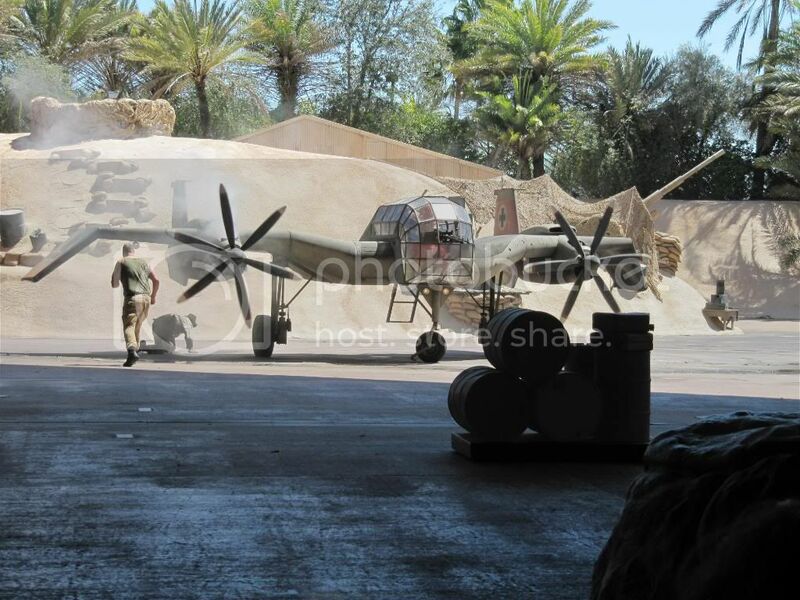 Note the totally flat propellers, fit for stirring, rather than pushing, air around the place. And the small greenhouse of a cockpit with the rather curious mounted machine gun in front of the pilot (who would be presumably a bit busy flying to waft a machine gun round the skies). Do I get any points.......? All very good guesses but Dave's done it again, it is a phantom. Guess you can't beat that Sweeting logic. 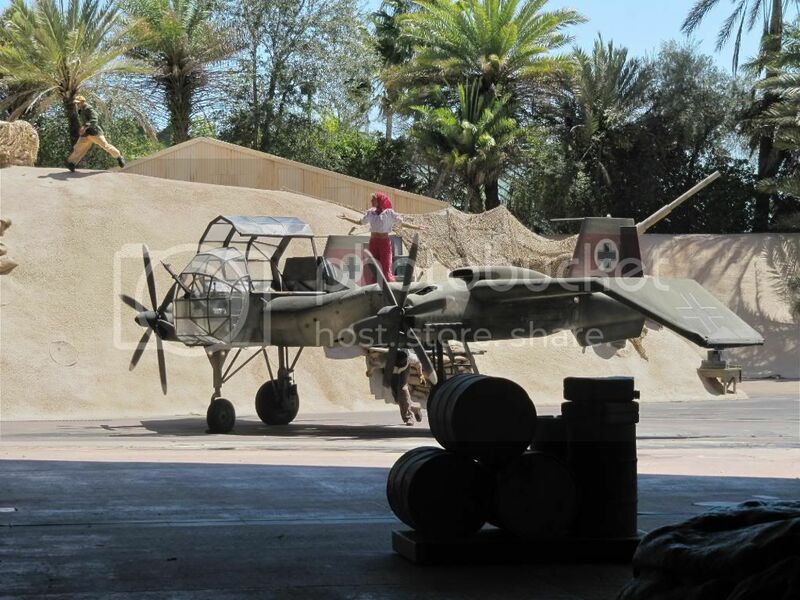 The aircraft is part of the Indiana Jones stunt show. 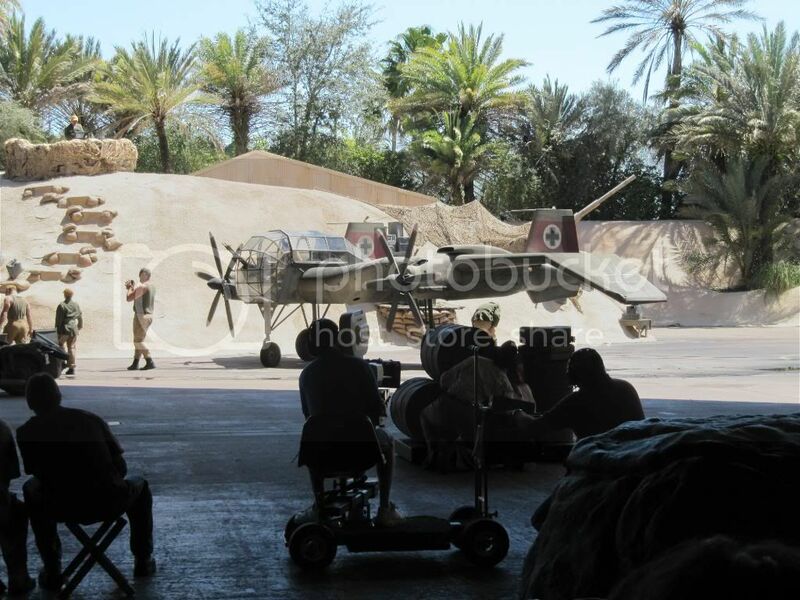 Trivia info' - the German soldier who fights Indy in that scene in the film was played by "Bomber" (Pat Roach) from "Auf wiedersehen, Pet", who is the only actor apart from Harrison Ford who appeared in the first three films. According to wikipedia, in "Raiders of the Lost Ark", Roach also played the sherpa who fights Jones in the bar in Nepal, so he had the rare opportunity to be killed twice in one film. In "Indiana Jones and the Temple of Doom", Roach played a cruel Thuggee overseer. He appeared only briefly in "Indiana Jones and the Last Crusade", as a Gestapo officer who runs alongside Colonel Vogel towards the zeppelin. A scene where he fights Jones in this film was cut. The role of Colonel Dovchenko in "Indiana Jones and the Kingdom of the Crystal Skull" was a stand-in for Roach, who died in 2004.